This page discusses our general bike recommendations. Please keep in mind that you don't necessarily need a new bike for the RAC. Thousands of people have ridden the RAC over the years. Many of these people are your friends and neighbors, so you almost certainly know someone with a suitable bike you could borrow. Used bikes are also significantly cheaper than new ones. If you are interested in a new bike, ones from previous model years are often available from your local bike shop at significant discounts. We don't recommend buying a new bike from a big box store like Walmart or Costco. Those are typically lower end bikes that might not hold up to the tough conditions on the RAC. A brand new, current model year, bike suitable for the RAC will probably cost between $400 and $600. If you spend more than that, you will get a nicer bike, but it'll have features you don't need for the RAC. The largest cog in the back should be as big or bigger (number of teeth) than smallest chainring in the front. Dedicated road bikes don't work very well because their gearing isn't easy enough and their tires aren't wide enough. Most 5th graders will outgrow a 24" bike by the time spring break rolls around, even if it fits them in September. A 29" bike (or "29er") is too big for most 5th graders. 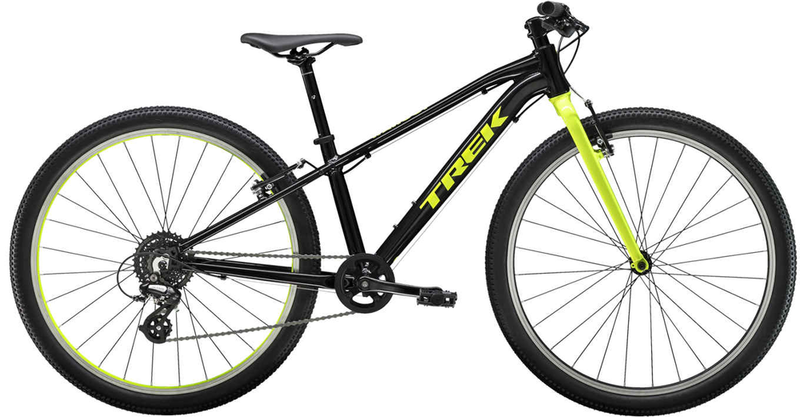 Here is a completely non-exhaustive list of bikes we found online that would work well. Please don't take these as recommendations, they're just examples. The RAC has quite a few very steep hills, so you need "easy" gearing. The sprockets attached to the cranks are called chainrings (all of them together are called a chainset). The smaller the chainring, the easier the gear. The sprockets attached to the rear wheel hub are called cogs (all of them together are called a cassette). The larger the cog, the easier the gear. Our recommended minimum gearing for a RAC bike is 1:1. This means that the largest cog in the back should at least be as big as the smallest chainring in the front. This tells us that there are three chainrings and seven cogs. The size of the chainrings are 24, 34, and 42 teeth. The smallest cog has 14 teeth, and the largest has 34. This is perfect, because the largest cog (34) is bigger than the smallest chainring (24). The number of gears isn't as important as the easiness of the easiest gear. That said, bikes with 7 or fewer cogs in the back will often have freewheels instead of cassettes. Freewheels are normally seen on lower end bikes and are more difficult to service than cassettes. All things being equal, we'd prefer a bike with a cassette over one with a freewheel, but this is a pretty minor point. During the RAC, you'll be riding on very poor roads, and even some dirt roads. Because of this, bikes should have tires at least 1.5" (38 mm) wide, preferably closer to 1.75" (44 mm). Knobby off road tires are fine but not necessary. Slicker "touring" tires roll better on paved roads, which is 95% of the RAC. Tires are very easy to change, so don't pass up an otherwise perfect bike because you don't like the tires. You can replace both tires for $50 or $60. Due to the gearing and tire size requirements, most riders (5th graders and parents) will be on light duty mountain or hybrid bikes. Hybrids are sometimes called City, Fitness, or Recreation bikes. Dedicated road bikes are specifically designed for well maintained paved roads. Because of this, they aren't well suited for the RAC. Some very experienced cyclists have made them work, but we don't recommend one for someone just starting out. For the above reason you should be looking at bikes with 26" or 27.5" wheels. 29" bikes (or "29ers") are too big for most 5th graders. A 5th grader’s RAC bike should weigh no more than 30 pounds, and preferably closer to 25. Bike weight makes a bigger difference to a 5th grader than to an adult, simply because they are physically smaller. An adult probably wouldn't notice a 5 pound difference, but it can be 10% of a 5th grader's body weight. Aluminum frames are lighter than steel, so generally preferred. Carbon fiber frames are lighter (usually) than aluminum, but very expensive and completely overkill for the RAC. Quick release (or thru axle) wheels, which you can remove without tools, are almost a "must have" feature for a RAC bike. You can count on several flat tires on the RAC and during training. Without quick release wheels, you'll need to carry a 15 mm wrench with you in order to remove your wheel, and it's a major pain in the neck. The following is a list of features that don't really make any difference for a RAC bike. A RAC bike does not require a suspension (i.e., shocks), but it doesn't hurt either. Suspension adds weight and cost. Disc brakes are not necessary for a RAC bike, but they will work just fine. The industry is definitely moving toward disc brakes for all bikes, so it's sometimes difficult to find new bikes with rim brakes these days. Mechanical disc brakes are no better, and arguably worse, than rim brakes. Hydraulic disc brakes are much better than mechanical discs or rim brakes, but definitely overkill for a RAC bike. They're also more difficult to service, especially on the road. Disc brakes are slightly heavier than rim breaks.